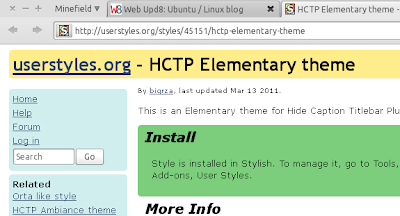 Hide Caption Titlebar Plus (HCTP) is a Firefox extension you can use to get the tabs in the titlebar (sort of). What the extension does is display minimize/maximize/close buttons next to the tabs and by using Compiz you can remove the maximized windows titlebar and get "tabs in the tilebar". We've covered HCTP last week so check out that post for more info: Firefox 4: Get Tabs In The Title Bar (Like Chrome). If you're using the Elementary theme, there's now a nice Elementary HCTP theme (style) to go with it. Download it @ userstyles.org. Wow, this post is huge. The introduction is 4 times longer then the actual post. Thanks to arzali for the info!